Deirdre's mother Bernadette Jacob with Crimestoppers investigators earlier today. DEIRDRE JACOB WAS was last seen 15 years ago in Newbridge, Co Kildare on Tuesday, 28 July 1998. Since her disappearance, her mother says “every day is difficult” and she has made a fresh appeal for people to come forward with any information they might have about the missing then 18-year-old. Try and remember back. Is there anything at all that could help us? Something that didn’t seem important at the time but might be important now… We need help. She recalled two unconfirmed sightings of Deirdre in a cafe on Tara St. in Dublin on 30 and 31 of July . “There was a very good description of a girl that visited the cafe on two different days, but we heard nothing from that even though we did appeal”. Bernadette also spoke of her daughter’s last-known movements and remembered the last phone conversation she had with her that morning while Bernadette was at work. Later in the day, Deirdre left her home at around 12.50 in the afternoon to walk to Newbridge where she visited her grandmother’s shop. She then headed to the AIB, Post Office and then back to her grandmother’s shop before walking back home on the Barrettstown Road. The last sighting of Deirdre was at the gate of her home at around 3pm. She was carrying a black canvas bag with the yellow Caterpillar logo (CAT), which has never been found. A number of other women went missing around the same time as Deirdre in the 90s, however, Bernadette said they don’t look at those disappearances and connect them with her daughter’s. We are no wiser today than on the day she went missing… It’s as if she just vanished. Commenting on the appeal, Superintendent Joseph Prendergast said that: “15 years on, we are very anxious to get some answers for Deirdre Jacob’s family. If you have any information, I urge you to call Crimestoppers today. Perhaps you saw something out of the ordinary at the time but dismissed it as unimportant. What seems insignificant to you could be crucial”. If you have information please contact Crimestoppers on the free phone number: 1800 25 00 25. Crimestoppers are anonymous. You may receive a reward for information which significantly helps the investigation. Email “'We don’t look at other cases of missing women in relation to Deirdre'”. 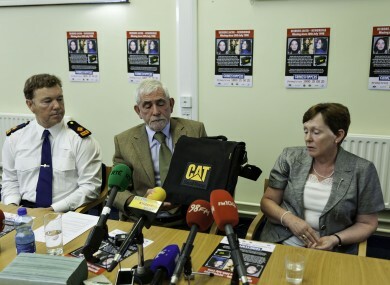 Feedback on “'We don’t look at other cases of missing women in relation to Deirdre'”.